The standard disclosure document is known as the private placement memorandum, or PPM, which typically gives potential investors the same general type of information that a public registration statement would provide. 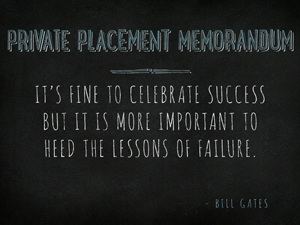 A private placement memorandum reflects the goals of a company. PPMs range in format and detail depending upon the exemption requirements, and even the sophistication of the prospective investors. In most circumstances, a private placement memorandum is drafted primarily to meet potential disclosure requirement of Illinois blue sky laws and federal securities laws, including certain antifraud provisions.